How do we develop "Black" Adenium? Today I would like to share how we've developed "Black" Adenium. We've spent 4 years to successfully develop the "BLACK" adenium. Full "Black" is used to be colour of dream because they never have this colour happened in adenium world before. We started using the 2007 adenium variety (Hall of fame) called “Double Color” which have only black border on red area. The basic concept to make full black all over petals is that we have to make black border to spread more and more into throat. The 2nd generation of wider black border is “Black Asia” (our 2008 Hall of fame). After that time, new trend of overlapping adenium petals was coming and very popular. Rosy Adenium that time was called “Dox Xon”, this was the first Rosy Adenium in the world. We didn’t want to spend more time on making the Black adenium single petal anymore but Black Rosy Adenium instead. That time, we used “Black Asia” crossing with “Dox Xon” and came up with new Black border Rosy Adenium called “Tonight I’m yours”. That was not full black petals yet but I was pretty happy with Rosy Adenium Black Border patterns. On beginning of 2011, we had deeper purple black Rosy Adenium called “Black Carnival” (our best sellers) and crossed with “Tonight I’m yours”. 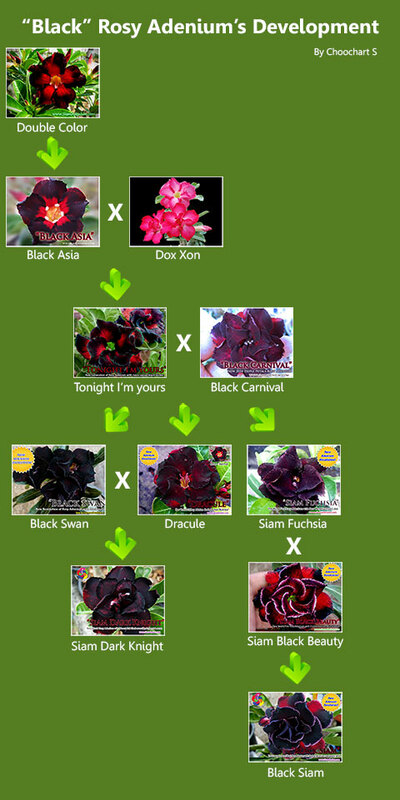 I was very much happy with the crossing result because they came up with 3 Black Rosy Adenium versions; “Black Swan”, “Dracule” and “Siam Fuchsia”. gave her a name as “Black Siam” (Black Inner petal layer and red with white border in outer petal layer). This was just my crossing works and see how fun it is. There are much more adenium varieties in my hands which I have not made crossing yet. For this year, I’ve worked very hard to make the new trend of Adenium’s Revolution on messy or disordered patterns. Let’s see our works on ending of this year. Have a great day.